The Consummate Hostess: Cheers, it's Happy Hour! 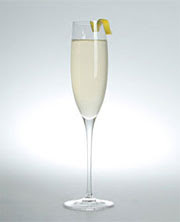 The French 75 is a superbly elegant cocktail. The name of the drink pays homage to two of France's most powerful weapons- guns and champagne, this drink is a classic New Orleans cocktail. Pour the gin, lemon, and simple syrup into a cocktail shaker filled with ice cubes. Shake well. Strain into glass. Top with champagne. Garnish with a lemon twist. This drink is at its most refined when served in a vintage cocktail glass. For something to nibble on, I suggest serving some nice creamy brie and crusty french bread. This entry was posted on 5:31 PM and is filed under cocktails , southern cocktails . You can follow any responses to this entry through the RSS 2.0 feed. You can leave a response, or trackback from your own site. That sounds delicious! I will definitely have to try that. And, I love the Oscar Wilde quote below. Fabulous! Great blog! This is my first visit to your wonderful blog!!! This cocktail sounds amazing!!! I am definitely giving it a try!!! I am looking forward to my next visit!!! This sounds like something we should enjoy next time we all get together.